Sloths, right? I'm with you. I LOVE Sparky! I was quite surprised at how much I loved DRUM DREAM GIRL. I need to read I'M TRYING TO LOVE SPIDERS and BERNICE too! Thanks for such a great list! Happy reading in the fall! Oh, my goodness - I haven't read ANY of these!!! I need to fix that! I DO have I'M TRYING TO LOVE SPIDERS an DRUM DREAM GIRL from the library right now, so I can at least start with those. Thanks for introducing me to so many titles! awesome choices! 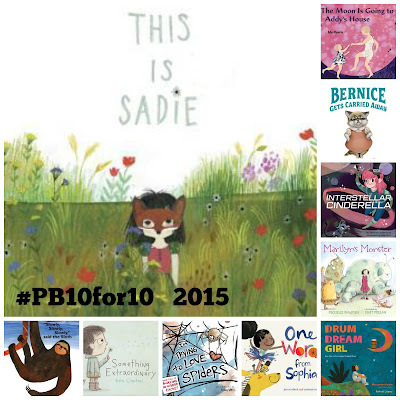 i love interstellar cinderella on many levels (one being rhyming), something extraordinary is a #pb10for10 all-star, and drum dream girl is beautiful (again, on many levels). enjoy 8th grade! I love that you're using picture books with grade 8 students. This is something of a hard sell with student teachers who aspire to teach at a secondary level. "Picture books are for kids, right? "...sigh...I persevere though. Enjoyed the list. I just have to join the chorus of LOVE that you share picture books with your 8th graders!! I love your list! I've only read one of them and I just finished requesting all the rest from our local library. I can't wait until they begin arriving. I'm especially looking forward to I'm Trying to Love Spiders....so true for me. :) Thanks! Hooray for sharing picture books with your 8th graders!! There are a bunch of new-to-me titles on your list that I need to read! Thanks!! Love love love This is Sadie. Interstellar Cinderella is another favorite of mine this year. This is an excellent list! I happened upon your blog due to the #pb10for10 (which I'm bummed I missed this year) and LOVE your list! Must get my hands on This is Sadie and Interstellar Cinderella.